This is a review by our perceptive guest reviewer Melanie. Thank you Melanie! 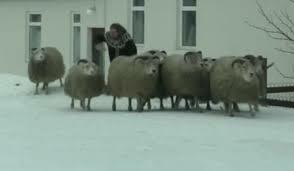 Bleak but beautiful, amusing yet gut wrenching, this simple tale of running sheep on the harsh and barren rocky highlands of Iceland is a deeply moving experience. Two brothers, both sheep farmers on the same land but with one brother in the family farm house and the other next door – haven’t spoken for 40 years. But their competitiveness gives way to compassion when a disaster forces them together. It’s slow and atmospheric but that just adds to the beauty of the piece. It’s hard to identify ‘the star’ – the landscape is spectacular and most certainly a star and in the opening shot I heard myself whisper ‘yes, that’s Iceland!’ (a cardinal sin to talk in a cinema but I think I got away with it). The acting is understated, a bit like the Icelanders, with the two brothers evoking great empathy, although I would have liked to have known more about what caused the ‘rift’ in the first place. The sheep themselves are strangely alluring with their massive woolly coats and innocent eyes and there was something quite moving about the brothers’ love for their sheep – but don’t take that the wrong way! Oh and of course there’s a cute sheep dog. What’s not to love? Take tissues – lots of tissues – and wear waterproof mascara.